Are you a sharpshooter from way downtown? Prove it against the best shooters on campus! Bring your A-game and knock down more shots than anyone else in one minute and you'll walk away a winner! 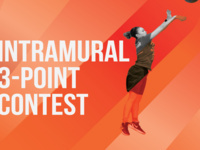 Register online at shsu.edu/IMSports or in-person by January 31. The event will be held on the HKC Basketball Courts, so stop by after playing a pickup game and give it a try! The Intramural Sports program provides the opportunity for you to compete and have fun in various team and individual sports. Leagues and tournaments are organized into different skill levels so you can play against other participants with comparable skills in a relaxed recreational atmosphere. Flag football, basketball, volleyball, soccer, softball, racquetball, golf, and tennis are just a few of the sports offered.